You can automate the data loading process using the CLI data loader. Suppose you want some data from your org to be extracted every night. You may want a CSV file which is kept at a particular location on a machine, to be uploaded into an org at a fixed time. NOTE: The CLI data loader functionality is only available for Windows Operating System. First of all, make sure you have the Admin rights on the machine. Then, download the data loader setup file on the machine by going into Salesforce environment Setup –> Data Management –> Data Loader. Choose the option “Download Data Loader for Windows“. It will download the latest version of data loader setup file. Install it by following the setup wizard. Also, you need to have the required version of JRE (Java Run Time Environment). Go to step a and b only if you don’t have the JRE already on the system, otherwise only check step c.
Download the latest JRE version from Oracle site downloads page. Install the downloaded JRE file. Validate your data loader directory looks like below screenshot. 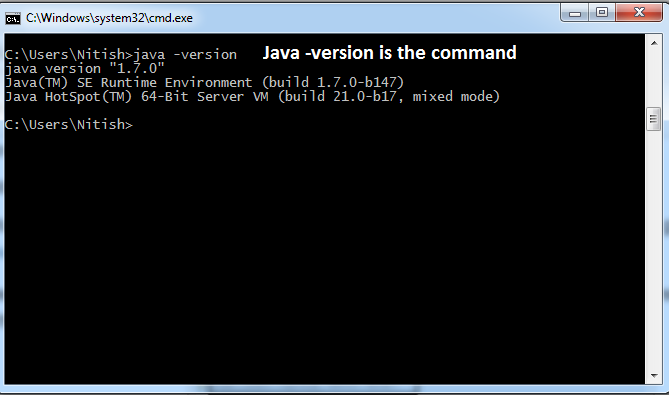 Make sure that you validate the JRE installation and version by hitting Java -version command on your Command Prompt Window as shown in the screenshot below. Open the command prompt window, and navigate to the bin folder of data loader directory (steps shown in screenshot below). We need to navigate to bin location, because encrypt.bat and process.bat both files exists here at this location. Use the command encrypt.bat -g anyKeyTextOfYourChoice . You can use any text you want to use as an Encryption key. In my screenshot, I have used myKey, but you can use any of your choice. Once you will hit enter, it will show you the encrypted version of your text. Copy that value (highlighted in screenshot), and save it in a .txt file and save the file at some proper location on your machine. It will be used in further steps. I have saved mine at “D:\data loader files\encryptionKey.txt” location. Step 2: Encrypt your Salesforce environment password by using the encrypted key prepared above. Our command was like: encrypt.bat -e nitish$0413 “D:\data loader files\encryptionKey.txt”. Copy the encrypted value of your password, we will use in further steps when creating process-conf.XML file. You need to create the mapping file by putting the CSV file header name on left side and Salesforce API name on right side. Save the file in .sdl format on your machine. If there are multiple fields and complex mapping, you can also take help of Dataloader field mapping UI, and save the mapping file from there instead of creating everything manually. Note: Make sure that API Name of fields should be exactly as in Salesforce. The API names are on the right-hand side of the = character in the mapping file. Capital and Small letters also make a difference and you may face issues. One sample process-conf.XML file has already been given in the data-loader directory Samples folder. 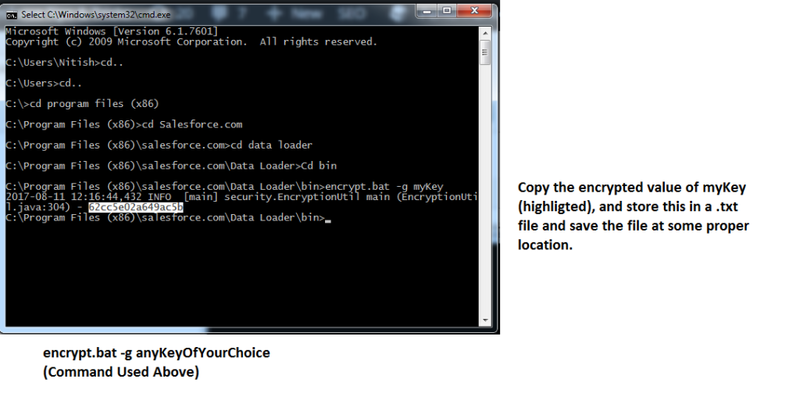 Copy that sample file and paste in the location at D drive, where we stored the encryptionKey.txt file as well. Keep all other files like mapping file, data files at the same location, which is “D:\data loader files”. Few others as shown in the text. Step 4: Hit the final command, and run the process for data load. You need to be at the same location as shown in above CMD screenshots, because process.bat file resides there only. Replace <file path to process-conf.xml> with the path to the directory containing process-conf.xml & replace <process name> with the process specified in process-conf.xml. In our case, it was process.bat “D:\data loader files” accountInsert. accountInsert is the process name mentioned in the process-conf.XML file. process-conf.XML file can contain many processes and you need to run one at a time by using the above command. Once the process is run, the success and error CSV files will be available at the location you mentioned in process-conf.XML file. Note: You should also take a look at the process-conf.XML file provided in samples folder of data loader default directory, to understand some other tags needed to upsert, export operations of data loading.